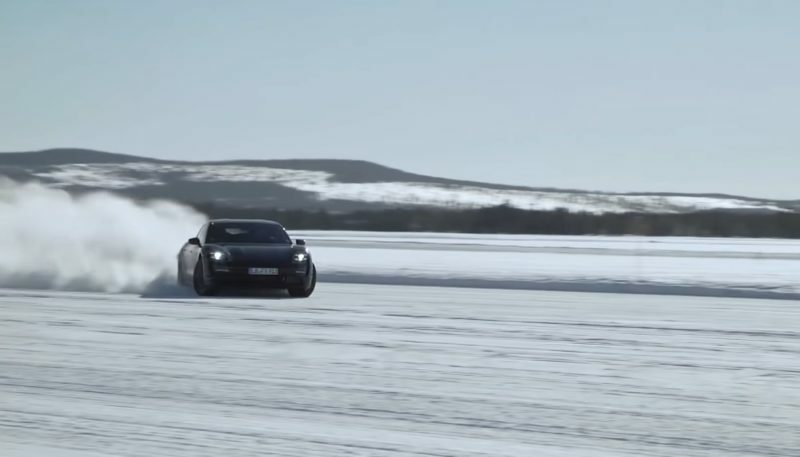 Porsche recently allowed a single automotive journalist, Tim Stevens of Roadshow and Carfection, to fly to the company's winter test facility in Sweden to take a look at how the new Taycan performs. The car isn't ready to be shown without camouflage yet, and much of the interior was hidden from his view as well, but this was an opportunity to ride shotgun in Porsche's first all electric production car. So here's what we can tell from his brief encounter. First and foremost, the Taycan likes to drift on snow and ice, which is a good sign. The fact that the traction control can be fully defeated with the quickness means we'll be able to do wild drifts and huge burnouts with Porsche's silent electric drive. With over 600 horsepower in the top of the line trim, and allegedly over 300 miles of range, this should put up a good fight against Tesla's Model S, while offering a more complete dealership network, faster repair times, and more accessible parts supply, not to mention Porsche's badge on the front. While there isn't much to be learned from a ride in the passenger's seat during the cold and windy winter testing of a car that still won't be shown to the public for a while, Stevens did mention that the top of the line car (which we think will be called Taycan Turbo, despite no turbos actually being installed) has all wheel drive, different modes including sport and sport+, and a rear biased power application with a limited slip differential. On the road, the cars were quiet and refined, easily soaking up bumps and reducing road significantly over any of Porsche's other road cars. With no engine up front (or at the back) Taycan drivers won't have to deal with the noise or vibration that an internal combustion engine inherently produces. While we probably won't get our hands on a production Taycan until the end of this year, it's nice to know that it's a polished and ready-for-prime-time piece of the Porsche puzzle already. It sounds like it's going to be a good one. May i suggest a GT3RS at full song, 9000 rpm sound track for the Taycan in Sport and Sport Plus and in Normal let the Electric motors, whir away to who want’s to be quite while driving around.